Eastern Canada is a Travel Photographer’s Dream—Just Ask Erin Lindsey of Escape Brooklyn. When she wants to get great photos at a travel destination, Erin Lindsey, founder of the travel site Escape Brooklyn, has a list of things she looks for. “I’m on the hunt for any body of water, dramatic terrain, deep forest, picturesque towns, dirt roads, historical sites, wildlife, moody weather, colorful sunsets, or thick fog,” she explains. The area in and around the Newfoundland city of St. John’s has all of that, as Lindsey discovered on a recent trip there. “I literally never set my camera down, except to sleep,” she says. Here’s where she went. Lindsey scored a seat at The Merchant Tavren—and enjoyed it so much she came back again. “The food was spectacular, and watching the open kitchen, I was struck by how happy they all seemed,” she says. “You could tell from the way the food was presented, and how good it was, that these people loved their jobs! That was way cool.” Housed in an old bank, the spot was great for interior photos, too. This classic route around the Avalon Peninsula clocks in at about 200 miles. Sampling a small piece of it, Lindsey realized she’d probably need a couple days to do it right. “My definition of a good driving tour for photos? Pulling over to the side of the road every five minutes for photos, which I totally did on the Irish Loop,” she says. 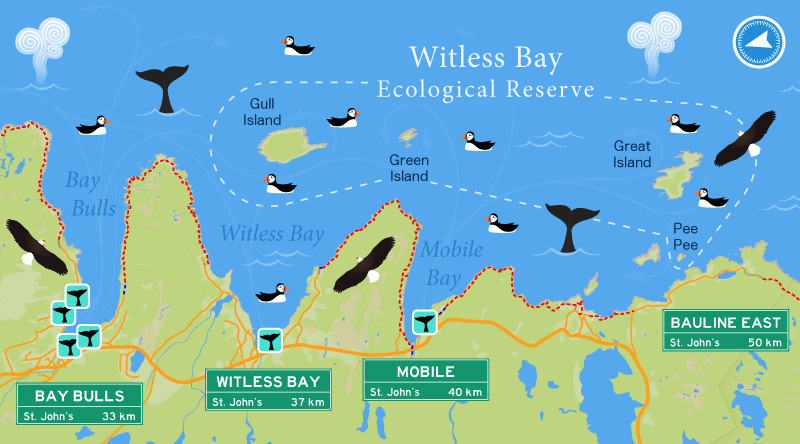 There’s abundant wildlife on the coast around St. John’s, and boat tours to the Witless Bay Ecological Reserve bring you within easy camera range. “The boat tour was one of my favorite parts of this trip! I’ve wanted to go whale-watching for as long as I can remember,” Lindsey says. “We didn’t just see one or two, either.” She tagged along with Gatherall’s, a family operator that’s been taking visitors out for three decades, which hooked her up with dozens of whale sightings. Earlier in the season, icebergs are a highlight, too. Awesome post! Newfoundland is a truly beautiful location that is taken for granted by many. As a travel photographer myself, I can really appreciate this piece. Thank you for sharing!